These days a bathroom should be nothing short of an oasis of wellbeing and relaxation. Which makes the use of colours and high-quality materials exceptionally important when it comes to meeting the requirements of functionality and design. 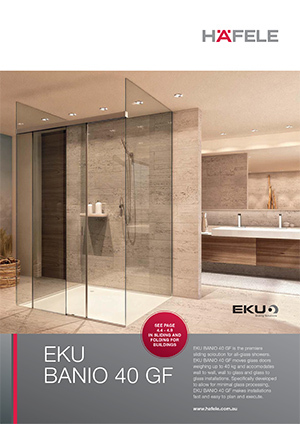 The premier solution for all-glass showers, EKU Banio 40 from Häfele fully lives up to this trend. Not only does its innovative sliding door technology leave plenty of space for creativity, it uses clean aluminium lines to emphasise the timeless elegance of the shower cubicle. EKU Banio 40 moves glass doors weighing up to 40 kg and accommodates wall to wall, wall to glass and glass to glass installations. Expertly crafted to allow for minimal glass processing, it’s also fast and easy to install. So if your brief calls for light, simplicity and luxury, you know where to turn.